AS SHOWN As shown in image: Clifton sideboard, Clifton side table, Clifton tall storage unit, column black marble table lamp. The Clifton family of storage and occasional furniture has been designed exclusively for Heal’s by Emile Jones. The design combines clean lines and a simple aesthetic with highlights of black metalwork and crafted detail with the use of oak marquetry. Designed to have an eclectic feel, the range includes round occasional tables and angular cabinets and shelving. 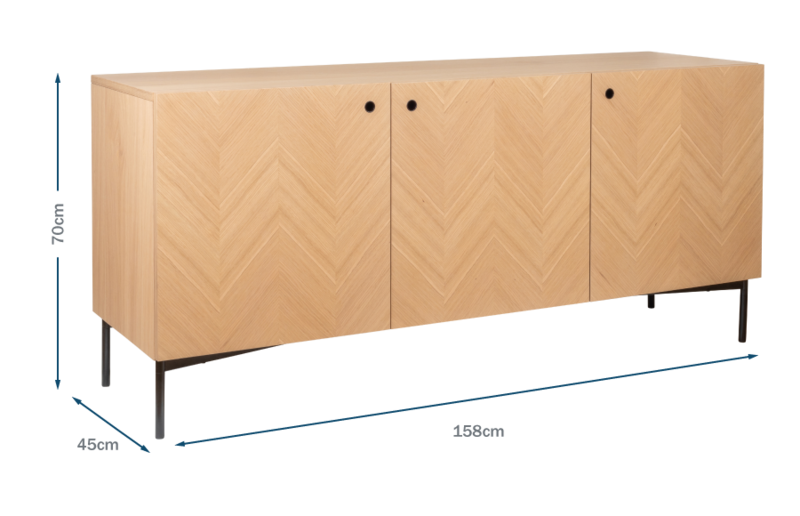 This sideboard features beautiful oak marquetry detailing creating a chevron pattern which is set against black accents. Inside the sideboard is a deep shelved storage area, perfect for placing DVDs. The Clifton sideboard will be a wonderful addition to your interior. Clean lines and a simple aesthetic with highlights of black metal work. Beautiful oak marquetry detailing creates a chevron pattern on the front of the doors. Beautiful oak marquetry detailing creates a chevron pattern on the sideboards doors. Storage shelf matching the units black accents. Slender refined legs contribute to Cliftons sleek profile. The basis and approach for Emile's work stems from an understanding of materials, manufacturing, brand and retail, following the product from concept to consumer. This results in simple, innovative and honest design, with a focus on every element down to the last detail, and above all useful. Nice piece of furniture. Fits beautifully into sitting room.